Ismailia: A crossroads of past and present on the Suez Canal The city of Ismailia, capital of Egypt's Ismailia Governorate, was founded in 1863 during the construction of the Suez Canal. While the canal, connecting the Mediterranean and Red Sea, was being dug, archaeologists discovered a treasure trove of artefacts from ancient Egyptian civilisations. These finds can be seen today in the excellent Ismailia Museum, along with a nearly intact stone sphinx dating from the 12th dynasty reign of King Amenemhat III. Ismailia’s cultural offerings reflect the city's role as a junction linking antiquity with modernity. Halfway between Cairo and Port Said, and fondly dubbed “The City of Beauty and Enchantment” by Egyptians, Ismailia hosts a yearly International Folklore Arts Festival as well as an International Film Festival for Documentaries and Shorts. Massive ships chugging along the Suez Canal transport goods from the four corners of the world, while in the typically Egyptian Market area, vendors peddle traditional crafts, and restaurants serve local seafood fresh off the boat. 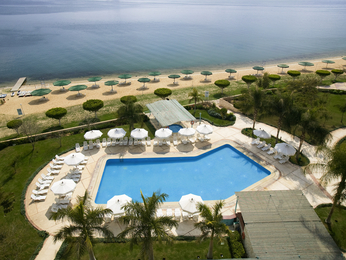 For a refreshing break, go swimming in Timsah Lake, or stroll the scenic and peaceful Sharia Salah Salem promenade.